Had you told me the weekend before Thanksgiving that I’d be soon flying to New Zealand once again, I would have told you that nothing could convince me to make the journey on such short notice. And then had you told me that I’d be enduring the long, sleepless flight over and back within the span of a single week, I’d laugh again. However, when you’re told that your grandmother has died, you act accordingly. For the most part, I’ll skip the trite observations about the impossibility of death — the cognitive disconnect between the box at the funeral and the tall, bunheaded, rugby-loving woman who used to come visit her American grandchildren. It does cross your mind, though, doesn’t it? — where there was once a person, there’s now just a body, suddenly and simply, and you just want the person to jump back into this newly empty vessel. Why can’t it be so simple? Just. go. back. in. None of that occurred to me as I carried the coffin in — bore the pall, I guess you could say, even though no one ever states it that way — but that maybe resulted from the fact that we walked in, the six of us and Granny-in-a-box, to a reworking of “Don’t Dream It’s Over”, and no, I’m not kidding, and yes, that’s the most ridiculously New Zealand thing to happen ever. No, it was strangest after the service, when the coffin just sat in the back of a car where anyone who wanted to could drop flower petals on it. People talked. I couldn’t really, not while knowing that my grandmother was in a wooden box in the sun on an unseasonably warm New Zealand spring day. Whenever I thought about it, my head swam in a manner that I’ve only experienced once before: in a medical lab with a partially dissected cadaver. I suspect that I’m keenly allergic to death. The photo I’ve posted above shows my dad’s family’s cemetery plot — a single rectangular acre surrounded on each side by paddock and currently containing the remains of only about ten of my family members. It’s serene, but only if you can accept mourning your loved ones in the presence of cows. 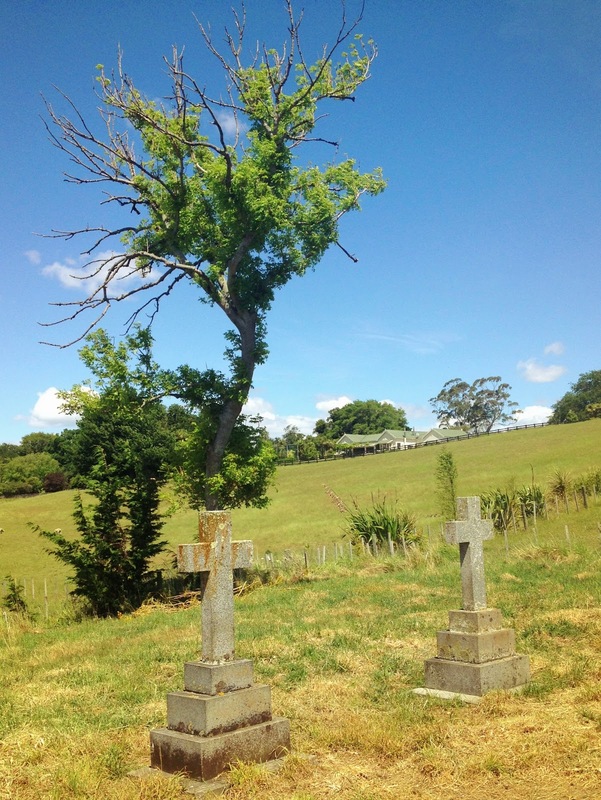 Really, the family plot represents an older, less settled New Zealand, when private cemeteries made practical sense. Nonetheless, it’s where members of my family can choose to be buried today. And nonetheless that, it’s not where my grandmother chose to be: She opted instead to have her ashes scattered around the house where she raised her children. And while I can understand the significance of this location to her, I can’t yet understand why she’d decide against giving her descendants a permanent spot to mourn her — a site like a gravestone that would be forever dedicated to her memory. Or am I just thinking about death in a more old-fashioned way than my grandmother did? No one talked about this, before or after the service, though I did answer more than once about whether I participated in team sports and where Californians put their sheep.